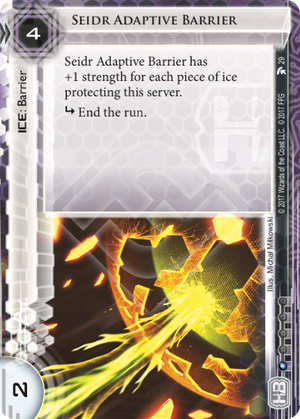 Does Seidr Adaptive Barrier have +1 strength from itself? Despite what the numbers say it's really 4 for a 3 strength barrier, not 2 strength since the +1 strength applies to itself as well. 4 for 3 strength, 1 sub isn't amazing, the neutral Bastion is 4 for 4 strength with the same 1 sub. Seidr Adaptive Barrier gains strength the more ice is in a server. With 2 pieces of ice it becomes 4 strength, equivalent to Bastion. With 3 pieces of ice it becomes 5 strength. Taking the generally efficient Corroder as a base to compare against Seidr is 2 to break in a 1 ice server (boost 1, break 1), 3 in a two ice server, 4 in a three ice server, etc. Note that the popular Eli 1.0 is 4 to break with Corroder as well. Eli is one credit cheaper to rez but has two disadvantages compared to Seidr: you can click through it and it's on the MWL. On the other hand Eli has a consistent tax while Seidr depends on how much ice is in front of the server. My gut feeling is that at 3 pieces of ice Eli and Seidr are about equivalent, all things considered. The tax is the same but Eli is 1 cheaper. Seidr on the other hand doesn't cost extra influence due to the MWL. At less than 3 pieces Eli has the upper hand while at more than 3 pieces Seidr is better. Comparing to other pieces of ice Seidr has a cost consistent with it's closest relatives (1 ETR sub barriers). A Wall of Static is 3/3, A Bastion is 4/4. Rainbow is 3/4 but can be broken with any breaker. Whether the strength gaining ability of Seidr outweighs its initial disadvantage of being a 4/3 in a one ice server depends on the amount of ice you expect to put in front of a server. From my experience R&D, HQ and a scoring server often have 3 pieces of ice in front of them around the mid part of the game. More than that is less common though by no means rare. As I said before I consider Seidr to be comparable to Eli 1.0 at 3 pieces of ice, taking into account the MWL. In fact I will go so far to say that Seidr is a strong contender as an Eli 1.0 replacement in many decks once Eli 1.0 rotates out. At 3 ice Seidr is solid. But it's when you go beyond that, into clear glacier builds, that Seidr really shines. From 4 ice onward Seidr becomes a really efficient, and at 1 influence it's a good choice for a glacier deck of any color. Seidr is in HB and I think it's quite fitting. It's Efficient from a cost/tax perspective. It's Reliable as you can't just click through it. And it's Humane since it doesn't try to kill the runner. A solid piece of ice, with a couple of conditions. Is every Runner in your meta packing Paperclip? Are you playing a glacier deck? If you answered "yes" to both questions, then this is the ice for you. With Paperclip breaking barriers more efficiently than Corroder, Seidr Adaptive Barrier is a good contender against Eli 1.0 to tax the Runner out. Against Eli 1.0, Paperclip will usually cost 3 to break (or 2 with a Datasucker token). Against Seidr, Paperclip will cost 3 to break if there's another ice besides Seidr protecting the same server. Every single ice on top of that just makes it's more taxing for Paperclip. The extra 1 rez cost compared to Eli 1.0 is also offset by the fact that you can't click through Seidr. Seidr also happens to have exactly the same amount of of influence as Eli 1.0, so decks that originally imported Eli 1.0 should consider replacing it with this. You probably don't want to rez this card as an early game gearcheck, though. But that's what Vanilla is for.